Totally unadorned list of posible interesting web sites that may have relevant information on small computers. Animated Lighting. Technology for controlling lights, music, and special effects. ALEUTIA provides a range of unique PCs and servers all with a focus on energy efficiency. Each system is stress-tested and assembled in the UK to ensure the outstanding build quality and reliability required to operate in remote area with no support. Compact High Accuracy Temperature Sensor ICs Sensor ICs ICs ROHM CO., LTD.
BeagleBoard is an all volunteer activity started-up by a collection of passionate individuals, including several employees of Texas Instruments, interested in creating powerful, open, and embedded devices. The BeagleBoard is an ultra-low cost ($149), high performance, low power OMAP3 based platform designed by BeagleBoard.org community members. and another one: ioBridge Imagine a world where everyday things are connected to the web and interact with people and other things. FarWatch (DS043)- Remote premise monitoring. NYC Resistor one of the country's most influential hackerspaces . MITs Scratch is a visual, block-based programming language that enables everyone, especially young people, to create sophisticated and interactive computer programs without having to know a syntax, text-based language. Raspberry Pi Foundation - is a UK registered charity (Registration Number 1129409) which exists to promote the study of computer science and related topics, especially at school level, and to put the fun back into learning computing. Our first product is about the size of a USB key , and is designed to plug into a TV or be combined with a touch screen for a low cost tablet. The expected price is $25 for a fully-configured system. Gooseberry developer boards: £40 alternative to the Raspberry Pi The Gooseberry Board was announced in a limited production run of 500 units and comes with a 1 GHz overclockable A10 processor, a 400 MHz Mali processor, 4 GB of on-board storage as well as Android 4.03 ICS. Rhombus-Tech , Allwinner A10 - ARM Cortex A8 SoC Another SoC system - $14 but watch out for software non support. Firebird32 Another Arduino Shield Compatible platform based on the Freescale 32-bit MCF51JM128 Flexis controller. FUBAR Labs Fair Use Building and Research Labs is a Nonprofit Corporation serving Central New Jersey. SheevaPlugs , $100 Linux wall-wart launches, GuruPlugs , FreeAgent DockStar Network Adapter | Seagate, Pogoplug , TonidoPlug , etc. RT Corp provides an Arduino-compatible board based on the Android ADK board design. Microchip provides a A PIC based USB microcontroller board. DIY Drones provides an Arduino-compatible board geared towards RC (radio controlled) and UAV (unmanned aerial vehicle) enthusiasts. Modern Device provides an Arduino-compatible board that supports the ADK firmware. Nanode is an open source Arduino-like board that has in-built web connectivity. It is a low cost platform for creative development of web connected ideas. Bitlash Online - an open source interpreted language shell and embedded programming environment. This website documents Bitlash for the popular and useful Arduino. What is NYC Resistor ? We Learn, Share, and Make things. A hacker collective with a shared space located in Boerum Hill, Brooklyn. Open.Sen.se At Sen.se, we believe there is no such thing as the Internet of Things. Tronisoft UK Company, serial devices. PandaBoard is intended to be used as a platform for mobile software development and OMAP" 4 processors are intended for manufacturers of Smartphones and other mobile devices. Beyond The Internet Of Things Towards A Sensor Commons a write up about "The Internet of Things" on SlashDot 1/3/12. Teensy USB Development Board is a complete USB-based microcontoller development system, in a very small footprint, capable of implementing many types of projects. All programming is done via the USB port. No special programmer is needed, only a standard "Mini-B" USB cable and a PC or Macintosh with a USB port. The XLP 16-bit Development Board provides a low-cost, highly configurable development system for Microchip`s new line of extreme low power 16-bit PIC24F microcontrollers which feature sleep currents down to 20nA. 3) Gumstix Overo, $115 Overo Sand to the $229 Overo FE COM with expansion boards ranging from $27 to $129. 4) CuBox, $135, no bigger than two inches in any direction and draws no more than three watts of power from its 5V power supply. 800 MHz dual issue ARM PJ4 processor, VFPv3, wmmx SIMD and 512KB L2 cache. 5) BeagleBoard-xM, $149, 1GHz Arm Cortex-A8. Arduino Shield List Pin usage details for 285 shields from 114 makers, and counting! Little Bits an opensource library of electronic modules that snap together with tiny magnets for prototyping and play. WM8950 : Mono ADC with microphone input, a low power, high quality mono ADC designed for portable applications such as Digital Still Camera, Digital Voice Recorder or games console accessories. HSA Foundation was founded June 2012 to enable the industry specification, advancement, and promotion of the Heterogeneous Systems Architecture (HSA) and help bring HSA-enabled platform and software solutions to the market, from mobile and embedded all the way up to HPC and Cloud Computing. Kinetis KL25Z Freedom Board - a low-cost ($12.95 Kit Contents: Board only) evaluation and development board featuring Freescale's newest Cortex-M0+ based Kinetis L Series MCU. Two well-known companies in the semiconductor space (element14, ???) drafted a plan to develop a low-cost, easy-to-use development platform to allow design engineers the flexibility and power to develop in the new Internet of things (IoT) space. The RIoTboard is an open source platform based on an i.MX 6Solo applications processor, using an ARM® Cortex®-A9 architecture. OLIMEX LTD - DEVELOPMENT BOARDS PRICE LIST Who we are ? Location: Bulgaria. PoKeys56E is an easy-to-use Ethernet IO device that combines a lot of inputs and outputs, and does not require complex programming knowledge. Pokeys56E provides 55 digital I/O (5V tolerant), 7 analog inputs (12-bit), PWM outputs and more. Sensordrone : The 6th Sense of Your Smartphone...& Beyond! Zealz GK802 TV Stick packs quad-core Freescale CPU onto a $99 PC-on-a-stick. When they put an Ethernet port on this it gets really interesting. redletterdave writes "Dell is reportedly working on a project codenamed 'Ophelia,' a USB-sized self-contained computer that provides access to virtually every major operating system  from the Mac OS, to Windows, to Google's Chrome OS, to cloud-based solutions from Citrix and Dell  all via the cloud. Powered by Android, Ophelia works just like a USB port: Just plug it into any flat panel monitor or TV, and boom, you have a computer. Ophelia connects to the Internet via Wi-Fi, and can connect to keyboards and other peripherals over Bluetooth. Not only is the computer portable and power-efficient, but to make it truly accessible, Dell plans to sell the device for just $50." Taipei, Taiwan, 17 January, 2013 - VIA Technologies, Inc., today announced APC Rock and Paper. Priced at US$79 APC Rock is currently available for order through the apc.io site. APC Paper is expected to begin shipping in March of 2013 at a price of US$99. For more details, please visit apc.io. Announcing Adafruit Gemma  Miniature wearable electronic platform! Love Flora but want a bite-sized version? Look no further, Gemma is a tiny wearable platform board with a lot of might in a 1? diameter package. Powered by a Attiny85 and programmable with an Arduino IDE over USB, youll be able to realize any wearable project! Thingsquare firmware can connect anything to the Internet. ZigBee, XBee, Z-Wave, WiFi, Bluetooth - What's it all mean? Whats The Difference Between ZigBee And Z-Wave? - Coments about Bluetooth and WiFi also. The Galileo board is an Arduino*-compatible development board. Make everything from responsive LED displays to smart phone controlled robots. 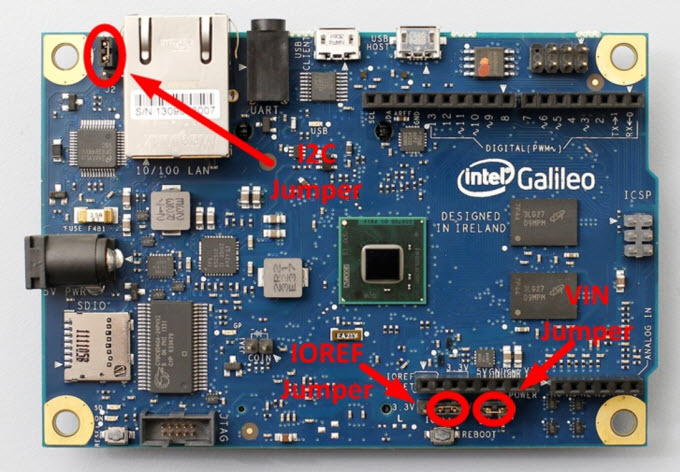 Intel Galileo jumper config ostensibly hardware and software pin-compatible with Arduino shields designed for the Uno R3. Embedded Linux, meet Arduino - Chipzilla style. The Register has a blurb on a new. This 3G shield for Raspberry enables the connectivity to high speed WCDMA and HSPA cellular networks in order to make possible the creation of the next level of worldwide interactivity projects inside the new "Internet of Things" era using your Raspberry Pi. Antennas not included. The Cellular Shield for Arduino includes all the parts needed to interface your Arduino with an SM5100B cellular module. Remember if YOU set up a HA system, only YOU will know how to fix, repair, update, modify it. Do not expect anyone else to know what it is, does, works, connections, power, programming, etc. This is for YOUR edification only while you live there! Do NOT expect it to add to the sale price of the house. You could provide all the documentation in the world, and unless the new owner can have a professional come in and certify, sanctify, purify and bless it, it's worthless. Nobody but you knows how it works nor how to fix it. The new owner, unless he is some weirdo hacker looking for a challenge will probably rip it out. Ask Slashdot: State of the Art In DIY Security Systems? Revolutionizing the Internet of Things - The RIoTboard Development Platform - an open source platform based on an i.MX 6Solo applications processor, using an ARM® Cortex®-A9 architecture. The platform is ideal for Android and GNU/Linux development and is designed for and supported by a community of Design Engineers and Application Developers. This is a FOREIGN (Australia) Institution so check credit/credentials and EASY transfer of same to a local institution before getting in bed with them. Open Colleges We are an accredited vocational training provider. Class2Go Take Stanford Online Classes. Anywhere. Coursera Take the world's best courses, online, for free. Great selection of I/O and small device micro controllers. The project Cheap Online Colleges is a comprehensive and informative resource that allows you to search for colleges and their respective tuition. I believe this type of information is very valuable to today's students who are not only dealing with a more competitive higher ed environment, but also with the rising costs associated with them. Please take a look and let me know what you think. If you are interested and think that this is useful, and powerful resource for people who want to pursue a college education, it would be great to see it listed on your site as something for people to refer to. Thanks for your help. I look forward to hearing back from you soon. Using Raspberry Pi and other server like devices devices sprinkle them all over one's network on all entrance ports, access portals and gateways They are cheap, really cheap, can be programmed to slow down one's attackers and mal contents and report on the activities. The steps for installing Dionaea on the Raspberry Pi can be found on this blog post. If you're deploying on an internal network, please follow our guide .